A melanocyte is a type of cell that's primarily located in the basal layer of the epidermis. Melanocytes produce melanin, a brown pigment that is responsible for skin coloration and protecting against the harmful effects of UV light. Melanocytes are also present in the hair and in the irises of the eyes. 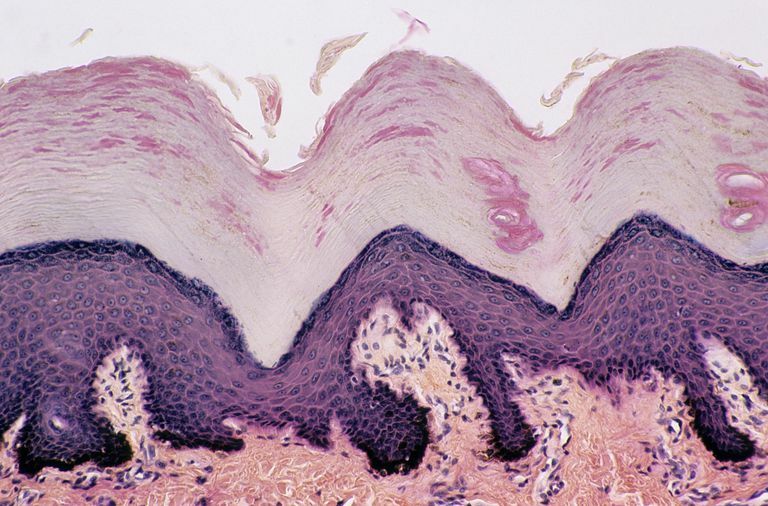 Melanocytes develop in the neural crest: a temporary group of embryonic cells that gets pinched off as the neural tube—or the pre-spinal cord—forms. During the embryonic stage of life, melanocytes move from the neural crest to the basal layer of the epidermis. Melanocytes are branch-shaped, which allows them to transfer melanin to other skin cells, like keratinocytes. Keratinocytes are the most common skin cells that strengthen the hair, nails, and skin. Melanocytes produce melanin, which gets deposited into the epidermal cells. There are two different types of melanin that melanocytes produce: eumelanin, which is dark brown in color, and phaeomelanin, which can have a red or yellow tint. Melanin production is regulated by a peptide hormone that's located in the pituitary gland and known as the melanocyte-stimulating hormone. Pituitary tumors and spiked estrogen levels that occur during pregnancy cause the pituitary gland to produce more of this hormone. But melanocytes don't always function as they should. Vitiligo, for example, is a hereditary skin condition in which melanocytes don't produce melanin, resulting in white, oval-shaped patches of skin that gradually grow larger. The lack of melanin also turns the hair in the affected area(s) white. Other conditions that are affected by a lack of melanin include albinism and phenylketonuria. The color of human skin varies. Its exact shade is determined by the blood that flows through it, diet, and the melanin produced by melanocytes. Humans generally have the same amount of melanocytes; the amount of melanin that those melanocytes produce, however, is what varies. Melanin protects the skin by shielding it from the sun. When the skin is exposed to the sun, melanin production increases, which is what produces a tan. It's the body's natural defense mechanism against sunburn. Everyone looks better with a glow, but it comes at a cost. Spending extended amounts of time in the sun (or in a tanning bed) is dangerous. Take a sunburn, for example. It takes time for melanocytes to produce melanin and protect the skin from the sun's harmful rays. When melanocytes can't work quickly enough to create a tan, the UV rays from the sun can burn the skin and leave it looking pink or bright red. Sun damage also accumulates over time, which can lead to skin cancer. The lighter your skin, the greater your risk of developing skin cancer. So make sure that you see a dermatologist regularly for a skin exam. Direct sunlight isn't all bad, however. The skin uses sunlight to make vitamin D, which absorbs calcium and is essential for bone strength and growth.